Last weekend, I took Marcus to Sakagura (I gave him free reign to pick wherever he wanted to go), a Japanese spot over in Midtown East, to celebrate his birthday. It was a recommendation from Tiffany, a former colleague of mine, who had nothing but great things to say about it. Having been there several times, she was happy to say that pretty much everything is great. 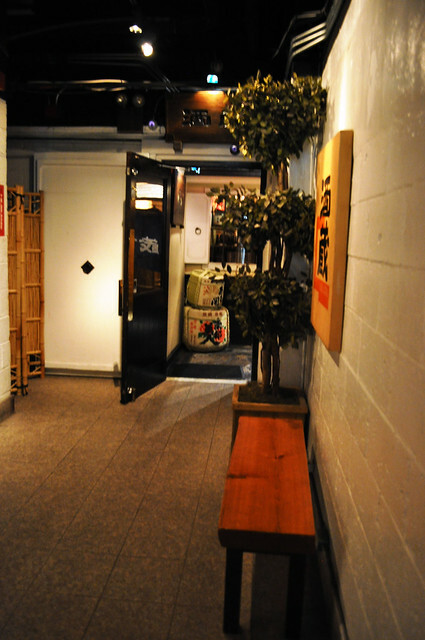 Sakagura is located in the cellar level of a corporate office building, so you may miss it your first time going -- at least that's what happened to us. 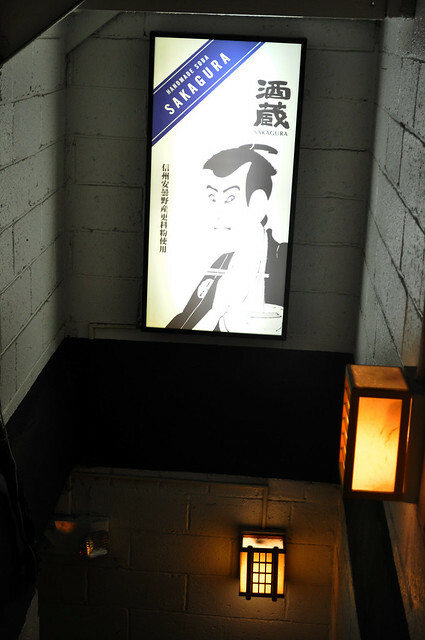 Luckily, there was a sign outside to indicate where to go, leading us to this lantern-lit stairwell. 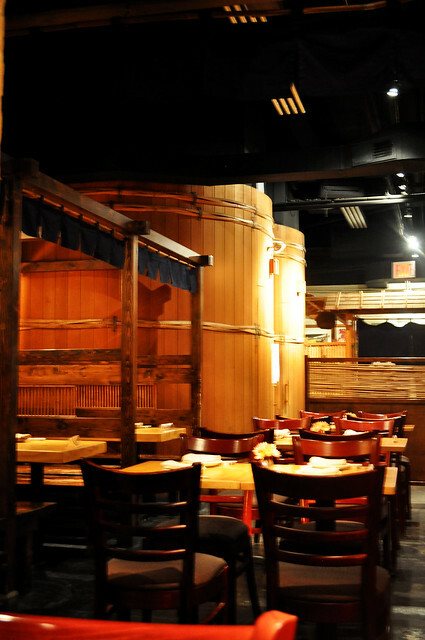 Japanese for "sake brewery," Sakagura was founded in 1996 and has become one of the top sake bars in the United States, offering over 200 varieties of carefully selected sakes as well as various authentic tapas-style dishes, and homemade desserts. The bar area inside Sakagura. 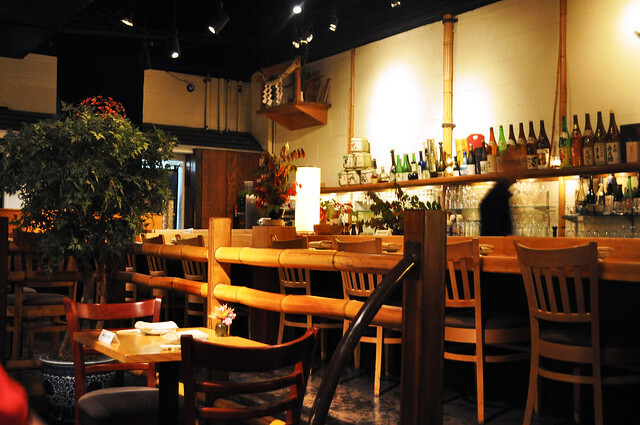 Look at the bar shelves lined with bottles of sake! Another view of the restaurant's interior. 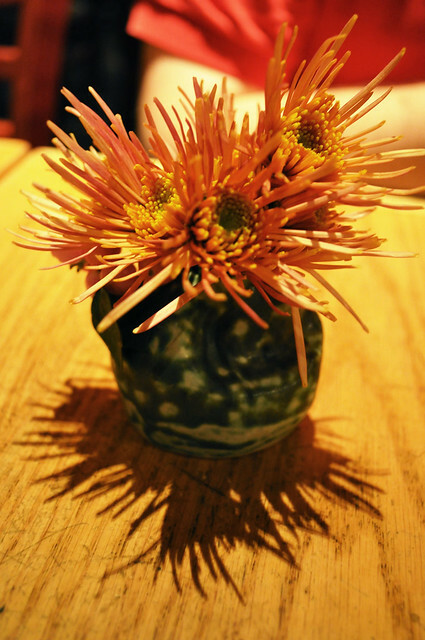 On the table was this cute little vase of pink blooms. 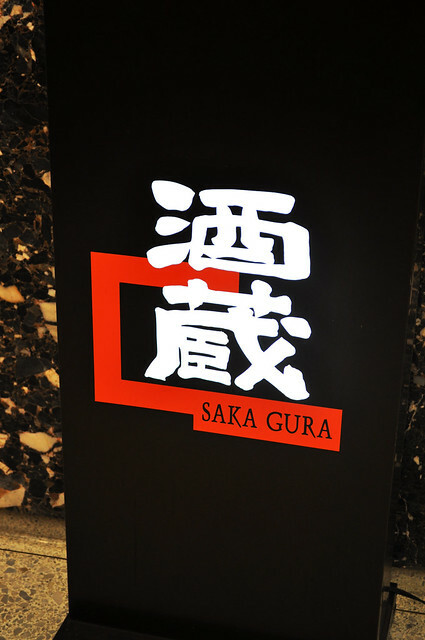 First, we had the surumeika yaki -- grilled Japanese squid brushed with garlic soy sauce. The squid was well-marinated with the garlic soy sauce (soaked in really nicely), and the grilled meat was incredibly soft and tender (not at all rubbery or overly chewy), which reminded me of a version of grilled squid we had at Izakaya Sozai in San Francisco. It made for a great first nibble. 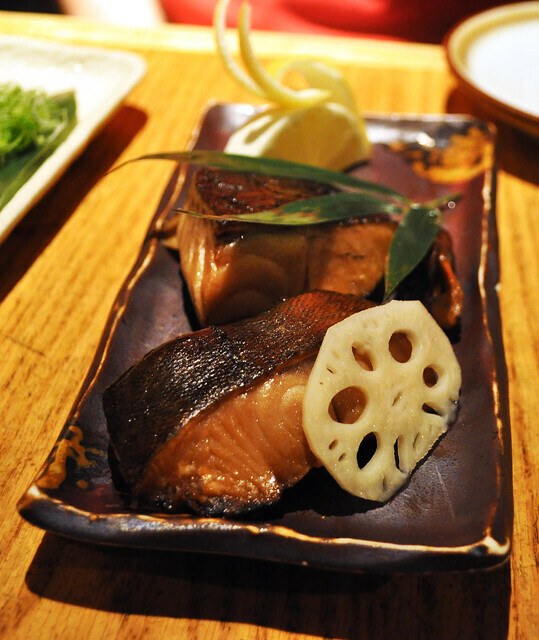 Next we had the gindara yuan yaki -- grilled fillets of black cod steeped in sweet soy sauce. While it was a bit salty (a little too much soy sauce here), the texture of the fish was still super flavorful and silky (just as black cod characteristically is). A little sushi rice would have helped neutralize the oversaturation of soy sauce. 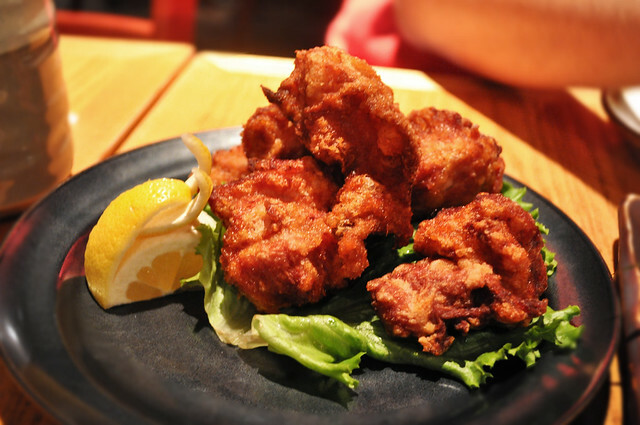 We also opted for the tori karaage -- deep fried chunks of chicken marinated in sake and ginger infused soy sauce. These were piping hot and pretty good -- the battering was thinly layered yet packed full of flavor from the herbs and spices. However, there was a little too much chicken and not enough battered bits to balance it out. This dish didn't seem like anything special or extraordinary, so while we did mostly enjoy it, it's not worth going out of your way and ordering. 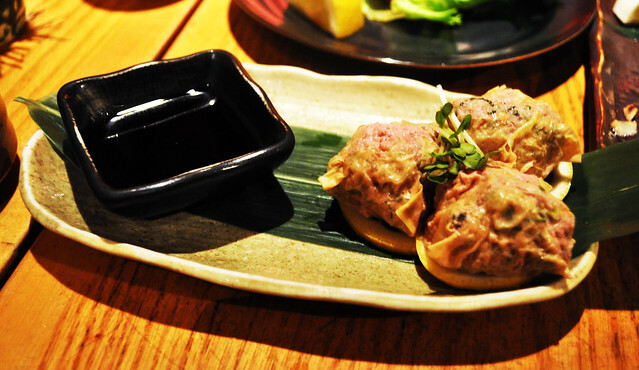 Marcus wanted to try the yuba shumai -- minced pork dumpling with shrimp and lotus roots wrapped in a thinly bean curd sheets served with a Japanese ponzu sauce. I honestly didn't like this dish at all -- I typically don't fare well with shumai of any kind, dim sum or not. The pork's flavor was a little offputting and overwhelming -- the spices used just didn't sit well on the palate -- and it seemed that Marcus felt the same way, too. It was our least favorite of the entire evening. 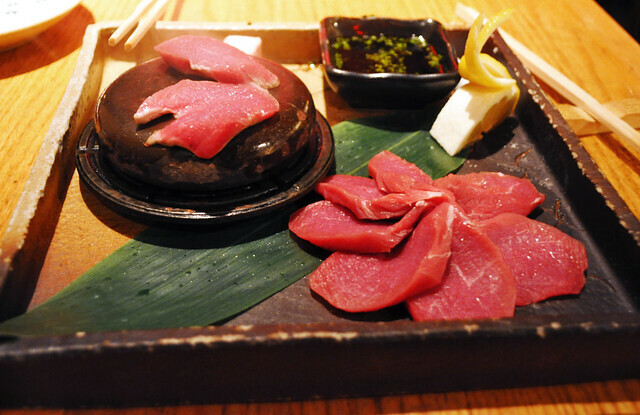 For the "main course" portion of the dinner, Marcus and I shared two larger-sized dishes, the first being the fillets of beef grilled on top of hot stone served with ponzu sauce, lemon, and sea salt. We were given a thick cube of frozen fat to coat over the scorching hot stone in preparation of searing the raw fillets of beef. Once the cubed fat touched the surface of the stone, it sizzled loudly, and the surface was ready to go in a matter of seconds. We seared each side to our desired liking (medium rare-ish), dipped lightly in the ponzu sauce, sprinkled a little sea salt, and squeezed a bit of lemon juice on top. What resulted were super tender beef fillets seared right off the stone and dressed nicely with some citrus undertones -- absolutely delicious and satisfying. While I do love a good cut of steak, this was a great way to enjoy some quality pieces of beef, optimized as it was cooked by you at your leisure and desired duration. So good! 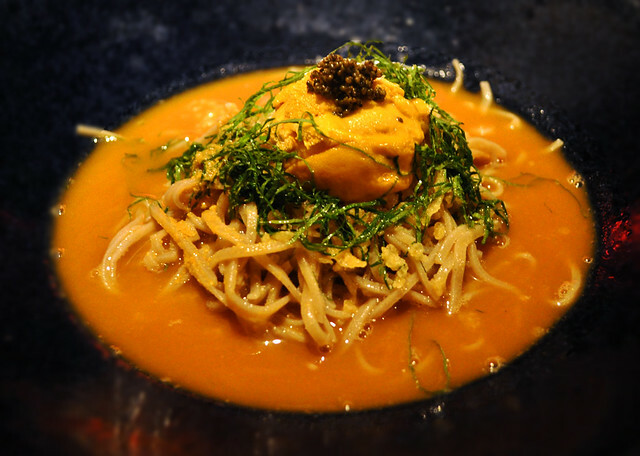 Of course, for our second main course, I had to have the uni soba -- homemade cold buckwheat noodles with fresh sea urchin sashimi and sea urchin sauce. Its close to icy temperature paired with the buttery texture of the uni and accompanying sauce sent a shiver down my spine -- it was chillingly delightful. I have the best boyfriend ever -- he let me enjoy the entire portion of uni tongues all by myself (he admits he's just not an uni fan), and I have to admit, I felt a tad guilty for eating it all (Lisa, where were you when I needed you?!). The soba was very fresh and cooked to the ideal texture, and the shredded nori (not pictured) went perfectly with it all (textural contrast and a little saltiness enhanced it a lot). It was undoubtedly one of the most noteworthy uni dishes I've had in New York City -- and I have had quite a few -- so I would say a trip out here just to have this would be worth it. For dessert, Marcus wanted to try a couple flavors of Sakagura's homemade ice creams -- earl grey tea and green tea -- so they brought it out on a textured glass platter with a candle and a birthday message written in chocolate. They both tasted how they should -- i.e., with the strong, pervasive essence of each tea's tannic characteristics as well as flavor profiles. Even at their frozen temperatures, each spoonful was bursting with concentrated tea flavors. Loved both! 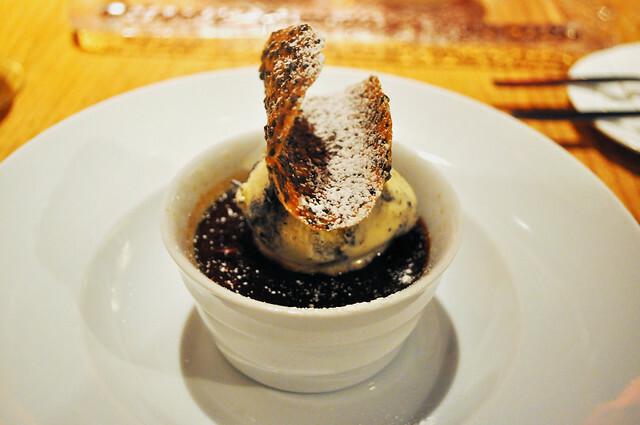 I desperately wanted to try the black sesame crème brûlée served with homemade black sesame ice cream. Given my propensities as a crème brûlée enthusiast, this unique, Asian-inspired take on the French classic just blew it out of the water. Not only was the ice cream made from black sesame seeds, but so was the custard in the crème brûlée. With the rich flavor and nutty yet silky texture from the crushed black sesame, this crème brûlée sang with such flavorful intensity that I swallowed it up in a matter of bites. Findings: Marcus and I had a fun time celebrating his birthday at Sakagura. Although we had a couple misses, we did get to enjoy some pretty strikingly flavorful small plates (noted: the surumeika yaki, the gindara yuan yaki, the fillets of beef grilled over hot stone, and the uni soba). If I could pinpoint one thing that Sakagura does well, it would be dessert. None of the desserts are super over-the-top, which is what I like best about them. They are simple, straight to the point. The homemade ice creams are solid, and the crème brûlée was quite delightful. I would certainly come back for the dessert as well as to sample the other many things the menu of small plates has to offer -- it's hard to judge a menu entirely by the half dozen plates we did order when the entire menu is comprised of so many other items. Either way, this little hidden gem (quite literally) is worth checking out -- lots of exciting things happening with Japanese cuisine here. Also, just wanted to wish Marcus another big happy birthday -- hope you had fun celebrating here. Love you! Price point: $8-10 for each small plate, $20-22 for each large plate, $7-9 for each dessert. Would you say that it makes more sense to go there strictly for the dessert?